The next scheduled Commencement Ceremonies for undergraduate and graduate students will be held Saturday, May 11, 2019. Ceremonies for both undergraduate and graduate students will be held at the same time with their prospective schools. Lineup is at 9 a.m.
North and South Doors open at 8:30 a.m. 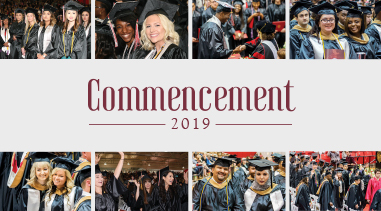 Lineup is at 2:30 p.m.
Ceremony begins at 3 p.m.
North and South Doors open at 2 p.m.
For more information, inquiries are welcome via email at commencement@sxu.edu or the commencement voicemail at 773-298-3867.